Display your love of robots - and the magazine devoted to them! These catchy, fun bumper stickers were taken from some of our most popular tag lines on the cover of SERVO. If you don't want one for your car, get one for your robot. It's what all the cool robots are wearing! • A one-year US* subscription to SERVO Magazine ^ all for only $40.00! Purchased separately, these items retail for $48.95. Order today — this offer expires December 31, 2004 or while supplies last! *In Canada, add $7.00 for subscription mailing. Other foreign, add $18.00. If this has not peaked your interest by now, let me tell you a few more startling facts of this early robotic device. 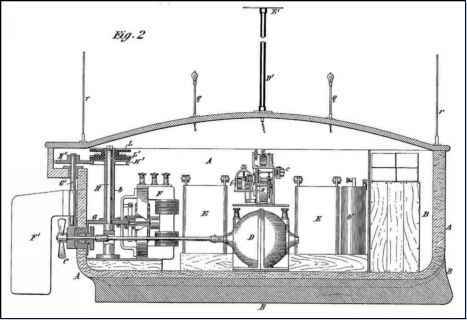 In the proper terminology of the day and in Tesla's own words, this device was a tele-automated vehicle, and was built in at least two different forms. One of these was a boat and the second was a submersible vehicle — a submarine, by today's terminology. What truly makes this amazing is that the original patent date for this invention was on November 8, 1898 — 106 years ago! Tesla's robot — either in boat or submarine form — was truly an amazing vessel. The basic unit was a steel, tub-shaped form with an internal power plant and rudder control. In addition, the boat had remotely operated lights onboard. Refer to the photo above for an outside look at this amazing submarine. 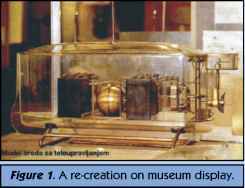 Please note that Figure 1 is a modern example of the internal workings of the vessel, as created at the Belgrade Museum. In addition, Figure 1 does not show any of the receiver or escapement mechanisms. The overall size of the vehicle is unknown by this author; one reference cites the boat as being as long as 30 feet. Regardless of the size, Tesla states that he had many working models. Inside the vessel was a myriad of relays, coils, and clockwork gear mechanisms (see Figure 2). The main functions of the vessel were forward on and off, left and right steering, and — in the case of the boat — mast mounted lights on each side of the upper deck. In addition, the submarine must have had some form of submersible control, as well. 1896, Tesla wrote, "I designed a complete machine capable of a multitude of operations, but the consummation of my labors was delayed until 1897. When first shown in the beginning of 1898, it created such a sensation such as no other invention of mine has ever produced." 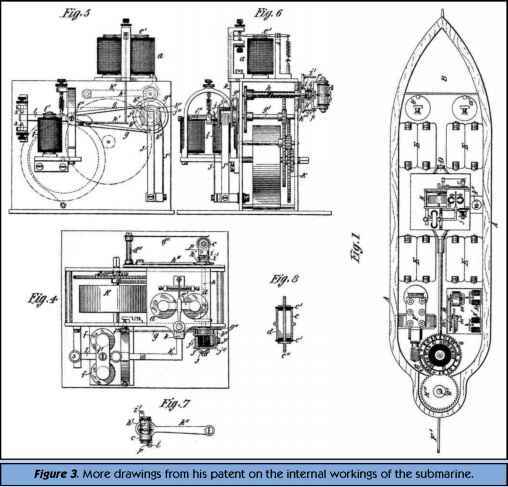 The basic patent was received in November of 1898, only after the patent examiner and chief had come to New York and witnessed the operation of the vessel. The examiner claimed it was unbelievable and was not willing to grant the patent without seeing the invention for himself first hand. In early 1898, Tesla demonstrated his boat at an electrical exhibition in the recently completed Madison Square Garden. The boat was equipped with, as Tesla described, "a borrowed mind." Tesla wrote that he had cleverly devised a means of putting the audience at ease, encouraging onlookers to ask questions of the boat. For instance, in response to the question, "What is the cube root of 64?" lights on the boat flashed four times. When a New York Times writer suggested that Tesla could make the boat submerge and carry dynamite as a weapon of war, the inventor exploded. Tesla quickly corrected the reporter, "You do not see there a wireless torpedo; you see there the first of a race of robots — mechanical men which will do the laborious work of the human race." This is a very interesting statement from a genius of this caliber. Tesla was to refer in other ways to his plans for automata or robots. Tesla wrote that he also proposed to design an automated car which, left to itself, would perform a great variety of operations involving something akin to judgment. Conceiving of robots having many uses he believed that their greatest role would lie in peaceful service to humanity. Tesla later described his 1890s activity. "I treated the whole field broadly, not limiting myself to mechanisms controlled from a distance, but to machines possessed of their own intelligence. Since that time, I have advanced greatly in the evolution of the invention and think that the time is not distant when I shall show an automaton, which left to itself, will act as though possessed of reason and without willful control from the outside." — whereby the course of such body or vessel may be directed and controlled from a distance and any device carried by the same brought into action at any desired time." "I am enabled by the use of my invention to employ any means of propulsion to impart to the moving body or vessel the highest possible speed, to control the operation of its machinery, and to direct its movements from either a fixed point or from a body moving and changing direction however rapidly and to maintain this control over great distances without any artificial connection between the vessel and the apparatus governing its movements and without such restrictions as these must necessarily impose I require no intermediate wires, cables, or other form of electrical or mechanical connection with the object, save the natural media of space." On extensive review of the patent and from period photographs, the operation of the vessel was quite ingenious. The boat had three motors and it is presumed that the submarine would have had additional motors to at least control the submersion. 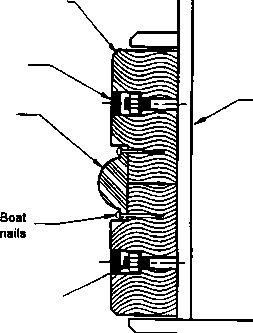 The first motor was for forward, the second motor for rudder control — both left and right — and the third motor would operate a clockwork brush mechanism that controlled the lights or any number of other circuits within the vessel. Figure 2. One image from his US patent application. if toy manufacturers know this method was used many years before them? The entire receiver section used a tuned circuit receptive to only one narrow frequency (see Figure 3). Tesla has claimed that he could have many hundreds of tuned circuits all operating on different frequencies and not interfering with one another. The actual reception of signal was performed by a device similar to what was used on telephone switchboards of the era. This consisted of a battery with its poles connected to two conducting terminals separated by a minute thickness of dielectric. In Tesla's words, "When an electrical disturbance reaches a circuit so arranged and adjusted, additional strain is put upon the insulating film, which gives way and allows passage of a current that can be utilized to operate any form of circuit controlling apparatus." This dielectric was known to break down easily after a period of use. Tesla designed a special dielectric system using powder inside a cylinder. This was periodically rotated or flipped automatically onboard the vessel to restore functionality to the system. With this new design, Tesla stated that many thousands of signal receptions would be maintained in a reliable method. There is quite an extensive description of this in the patent and I encourage readers to review this. After the detector received a signal, a series of gears and an escapement system were used to count the signals and direct battery power to the various motors. Readers will note that this was the same method used in the early AM radio control aircraft of our so-called modern generation. Once again, considerable detail of the entire gear train, escapement mechanism, and clockwork system is described in Tesla's patent. A simple understanding of this, however, shows that Tesla used varying length pulses of frequency from his transmitter to force the receiver to move its relays in various manners. According to the patent, Tesla could do all of the following, all as separate entities: drive forward, drive forward and left at 45 degrees, drive forward and left at full travel rudder, drive right at 45 degrees and forward, and drive right and forward at full rudder deflection. Additionally, with the motor in neutral, he could send certain pulses and activate his accessory motor. This motor would once again count pulses and control the onboard lights in a certain manner. He could tell the lights to turn on or off as singles or in pairs. Also, he could tell the left light to come on when the vessel was going left and the right light to come on when the vessel was going right. I would go into the detail and workings of this escapement system, however the information is quite technical and is contained in over five pages of patent text. Once again, I encourage the reader to review the patent itself for further details. Tesla always had far reaching visions for his inventions. His patents also included specifications for a torpedo boat without a crew. Six 14-foot torpedoes were to be placed vertically in two rows so that, when one was discharged, another would fall into its place. It is unclear if this torpedo boat was shown at Madison Square Garden or not. From the reference to the reporter by Tesla, it is possible that this torpedo boat was shown in early 1898. Figure 4. Top view of Tesla's R/C boat. \ . and Scratch Builder Supplies.